Johnson and Johnson makes the Acuvue brand of contact lenses. All Acuvue contact lenses in Canada used to be either two week replacement, or one day replacement. Now, an new monthly lens called Acuvue Vita is available. 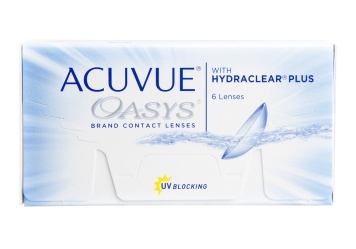 Acuvue Oasys 1-Day - The comfort of the two week Oasys silicone hydrogel lens is now available in a daily disposable format. This new daily disposable lens, made with HydraLuxe technology, is a tear infused design. Tear-like molecules integrate with the wearer's own tears, which reduces symptoms of tired and dry eyes. Two base curves are available. Acuvue Oasys 1-Day for Astigmatism - The same comfort of the Oasys for Astigmatism lens in a convenient daily disposable format. 1-Day Acuvue TruEye - This silicone hydrogel contact lens allows the comfort of the lens to be much better than a traditional daily disposable, because of increased moisture and breathability. The lens also has UV protection. Available in 30 or 90 packs. 1-Day Acuvue Moist - This daily disposable gives superior comfort all day. Also provides some UV protection. Available in 30 packs or 90 packs. 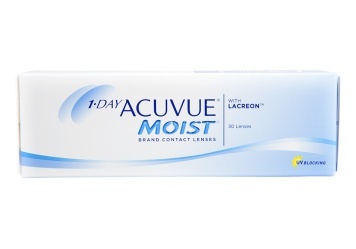 1-Day Acuvue Moist for Astigmatism - The same comfort of Acuvue Moist in a lens for those who have astigmatism in their pscription. Widely available in 30 packs, and available in 90 packs in some areas. 1-Day Acuvue - The original Acuvue 1-Day lens. Available in two base curves, but 30 packs only. Acuvue Oasys - "Say Goodbye To Dry" is the advertisement for Acuvue Oasys. One of the most comfortable and moist lenses available, this lens is very popular with many people of all ages. Made from silicone hydrogel, with Hydraclear Plus. Some people need to rinse the lens after opening the package if they are sensitive to the solution it is stored in. Oasys is approved for overnight wear for up to one week. Please see our section on extended wear contact lenses if you want to wear your contact lenses overnight. Available in 6-packs or 24-packs. 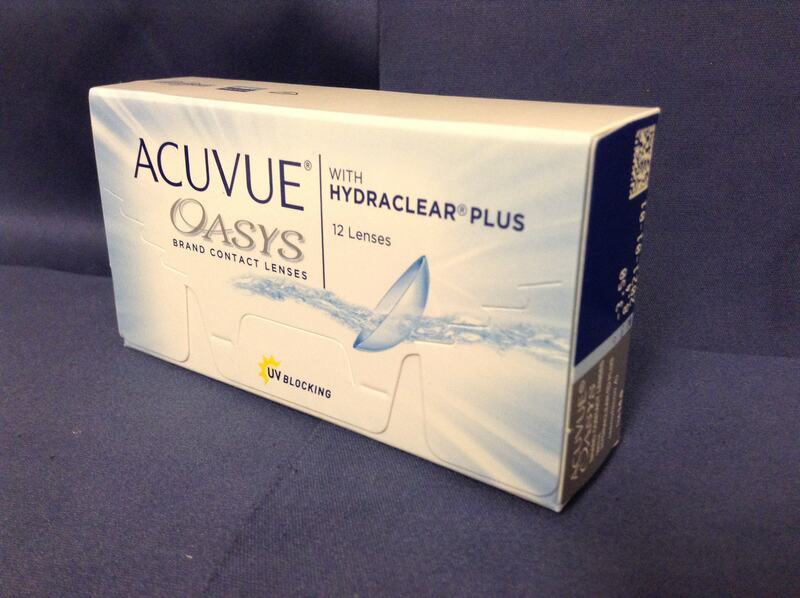 Acuvue Oasys for Astigmatism - Oasys also comes in a Toric lens made for those who have astigmatism. They have a special "accelerated stabilization design" which is different than the ballast design in toric lenses, which are weighted in order to prevent the lens from shifting, and thus blurring vision. The Oasys design has thin sections under upper and lower lids, and thicker regions in between to stabilize the lens. It's means that gravity does not play a part in stabilization, and you can lie down while watching TV or reading a book, and still have clear vision. Acuvue Oasys for Presbyopia - This Oasys lens has been manufactured for those who need a bifocal lens. The same Oasys comfort gives you near, arm's length (computer) and distance vision. Acuvue2 - The new and improved Acuvue lens became one of the most prescribed lenses because of its superior comfort and clarity of vision. Only with the advance of silicone hydrogel lenses has the Acuvue2 lens become less popular.